Something happened in the library today that reminded me of the power of a picture book. I was reading Harry By the Sea by Gene Zion to a group of 1st, 2nd and 3rd grade students. One girl in the group was so engaged by Harry’s adventure that the rest of the world ceased to exist for ten whole minutes. In fact, while I was reading the story, her dad, a teacher in the school, walked into the library, put something on my desk, walked back to the group, watched his daughter for a moment, and left the room. His daughter never noticed him standing ten feet away from her. She was with Harry. She laughed when a wave covered Harry with seaweed and looked relieved when Harry was reunited with his family. As I was reading to the children, I was aware of what was happening, and it made me so happy that paper, ink and glue continue to work their magic. When you think of famous characters named Harry from children’s literature, you probably think of the Hogwart’s student, but in honor of today’s opening of the Westminster Dog Show, I’m thinking of another Harry. Harry the dog, of course — the star of four picture books by Gene Zion and illustrated by Margaret Bloy Graham. These stories about the adventures of Harry and his family are not the newest dog books on the shelves, but they have staying power. There are four books about Harry: Harry by the Sea, Harry the Dirty Dog, No Roses for Harry and the early reader, Harry and the Lady Next Door. 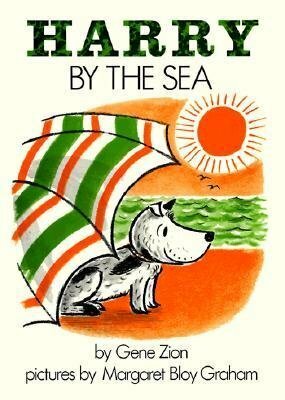 There are very few picture book images I easily recall from my own childhood, but I can still remember Harry in the coal truck where he changes from being a “white dog with black spots to a black dog with white spots.” And in Harry by the Sea, Harry rolls around in so much seaweed that he’s unrecognizable to his family. Clearly, this dog would not pose a threat to any of the dogs in the Westminster Dog Show, but he’s irresistable! I’ve never met a child who doesn’t love the Harry books so if you missed these stories during your own childhood, be sure to introduce your children (and yourself) to Harry.